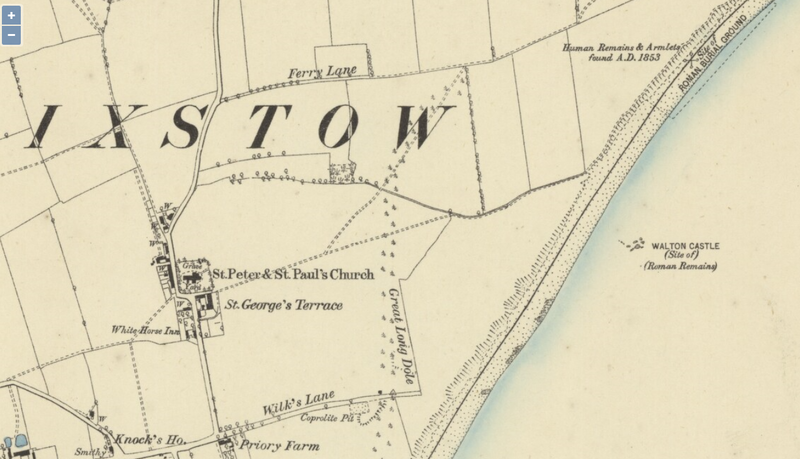 The old Victoria History of the County of Suffolk, on the landscape near Felixstowe Roman fort, refers to a close known as “Great Long Dole”, which apparently bore that name in 1907. This gave no results in Google. 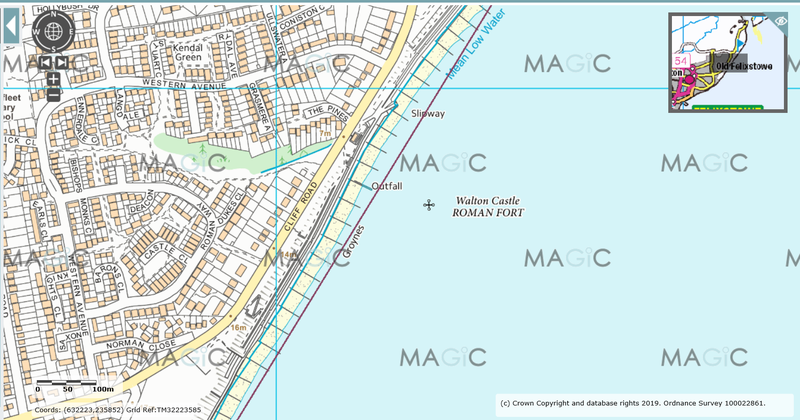 Fortunately the old Ordinance Survey maps are online (although for some peculiar reason the new ones are not). This provides illuminating information, including the location of said “Long Dole”. Great Long Dole is no longer marked – the name must have become obsolete – but Brackenbury Barracks have appeared, and the Cliff Road. Note also the stream, running onto the beach, near the castle ruins. This must be the source for the “Dip”, where the stream cuts through the soft sand to reach the sea. The barracks have vanished – this seems to be a contemporary map – and the whole area is now covered with houses. But the outfall of the spring is still marked. It’s now in a pipe running under the road. But this spring is probably the water source for the garrison. The location of the Roman fort need not be attended to, tho. I believe that in fact they are about 30 metres offshore from that outfall! I’ve also wondered whether aerial photography might show the ruins. Surely it might! Likewise… what about Lidar? There are downloadable datasets, I know; although, mysteriously, I could find no online browser to see the data. The nearest that I got was this, where the resolution is rubbish. 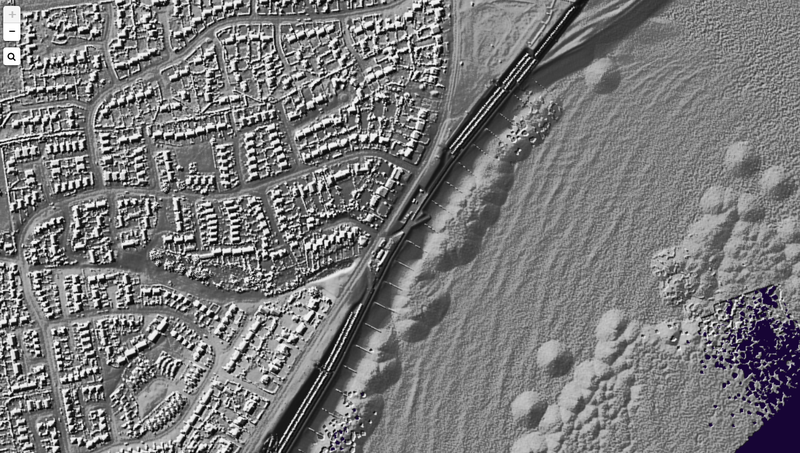 Yet Lidar datasets are available down to less than 1 metre, this I know. Is there something, just in front of the sea-front buildings? Maybe there is; but at that resolution, where a house is just a block, who can tell? Lidar is beyond my knowledge. Googling is not producing anything very useful, although I did find this. I might have a go at this a bit later. I’m getting nowhere with it, I must admit. The Environment Agency stuff is completely unintuitive – I can’t even work out what I can and can’t download. I will most likely have to abandon this and leave it to the professionals. At least, as a result of this post, there is now a result for “Great long dole” in Google search.